Double Dutch is a feminized indica dominant Marijuana strain from Serious Seeds. It is easy to grow and adapts to any kind of culture media. Double Dutch seeds produce very aromatic plants with a deep fruity taste. Double Dutch is a feminized indica dominant Marijuana strain created by crossing the famous Chronic with Warlock from the same seed bank. 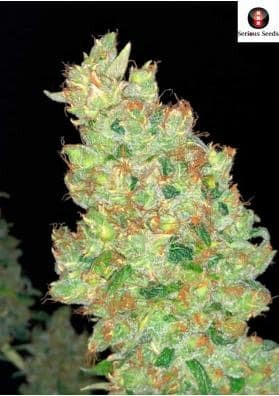 This strain stands out for its high performance, mainly on indoors where its compact morphology with short internodal distances, favor the appearance of fantastic and appetizing resinous buds. Due to this characteristic, we strongly recommend to give some support to the branches to avoide their breakge at the end of the flowering period. Double Dutch is very easy to grow and does not require any special need thus being suitable for any kind of crops and substrates. Its power is high or very high. It does not develop too much THC, but do not be fooled since it is loaded with other psychoactive elements and narcotics like CBD. Hence, this strain is not recommend for nove or first-time consumers. Double Dutch Marijuana produce very aromatic plants, an aroma reminiscent of berries or flowers. In this way, we recommend to use anit-odor filters. It flowers at 8 weeks in a growing room, while on the outside the bloom period lasts until early October in the Northern hemisphere.